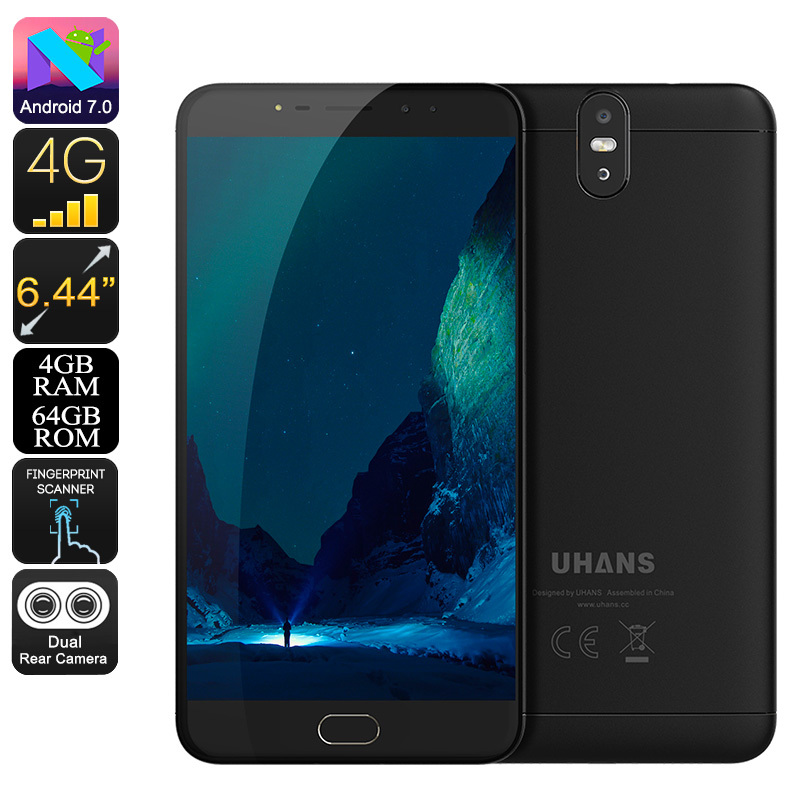 Successfully Added Uhans Max 2 Android Phone - 6.44-Inch Display, 1080p, Octa-Core CPU, 4GB RAM, 4300mAh, 13MP Dual-Cam, Android 7.0 (Black) to your Shopping Cart. On the stunning 6.44-Inch IPS display of the Uhans Max 2 Android phone, you’ll be able to enjoy your favorite media like never before. Treating you to crisp 1080p resolutions, this Android smartphone is sure to take your mobile media experience to the next level. The phone comes packed with a 4300mAh battery that brings along up to 12 hours of continuous usage time. This means that your phone will get you through several days of regular smartphone usage without needing to recharge. With 64GB ROM and a 128GB SD card slot at your disposal, you won’t have to worry anytime soon about running out of storage for all your files and entertainment. Underneath the large display of this Android phone, you’ll find a powerful Octa-Core processor. Clocked at 1.5GHz, this CPU is capable of handling anything you throw at it. Along with 4GB of RAM, this Android smartphone is sure to meet all your demands without dropping a frame. Whether you’re into games, films, or Apps – there is nothing the Uhans Max 2 can’t handle. Coming with Google Play pre-installed, this Android phone treats you to free access to millions of the latest Apps that can be easily installed onto your phone with the press of a button. With its Android 7.0 operating system, this latest Android phone treats you to all the latest software features available. It comes with Dual-IMEI numbers and 4G for increased connectivity. With this Android smartphone in your pocket, you’ll always stay connected to your friends and family. The cell phone furthermore comes with a stunning 13MP Dual-Lens camera. This little snapper lets you shoot breathtaking images and video of all those upcoming special moments in life. The Uhans Max 2 Android phone comes with a 12 months warranty, brought to you by the leader in electronic devices as well as wholesale smartphones..